A globally-recognised expert in the Unified Communications market, RingCentral is a publicly-traded company, with a background in UC, contact centre solutions and “Software as a Service,” or SaaS. The brand’s cloud-first approach to communication technology has made it an innovator in a world driven by remote working, flexibility, and globalisation. With APIs, cloud-based communication technology, and a host of convenient communication management services, RingCentral delivers exceptional results to companies all around the world. Though the company is headquartered in California (Belmont), it also has regional offices, in Canada, the UK, the Philippines, China, Russia, and the Ukraine. Here, we’re going to cover everything you need to know about RingCentral. Based on reports by the Synergy Research Group, RingCentral was the worldwide leader in market share for Unified Communications as a Service, as of June 2017. Today, the company has earned multiple accolades for it’s “as-a-service” offerings on the cloud, which optimise performance and minimise initial investment. RingCentral sells subscriptions to its cloud-based products directly through internal sales teams and its website. However, the company also thrives through a highly motivated group of resellers and partners like AT&T, TELUS Communications, and even BT in the United Kingdom. The RingCentral brand initially began in 1999, when a man called Vladimir (Vlad) Shmunis founded the company with a desire to unlock the true potential of cloud technology. He believed that the flexibility of the cloud could support growing organisations in the digital world and give them the versatility they needed to adapt in a rapidly-changing agile workforce. Thanks to the innovation of Shmunis, and a strong focus on delivering exceptional communications experiences, RingCentral has grown from a start-up company designed in 2006 with $12 million in funding, to a publicly-listed NYSE company which crossed the $600 million total ARR milestone in 2018. RingCentral shares have a relative strength of 96 out of a possible score of 99 – making it a high-performing company in the New York Stock Exchange. From an employee perspective, RingCentral is also an incredible place to work. Currently, RingCentral has approximately 2,500 employees, who rate the business on Glassdoor as a 4.5 out of 5 for workplace satisfaction – a high rating. Currently, RingCentral supports more than 350,000 businesses around the globe. It’s recognised as one of the fastest-growing and largest pure-cloud communications solution providers in the world. In fact, RingCentral has been named a leader in the Unified Communications as a Service Magic Quadrant by Gartner for 2015, 2016, 2017 and 2018. Vonage: Revenue of $1 billion per annum – read RingCentral vs. Vonage: Which Vendor is Right for You? 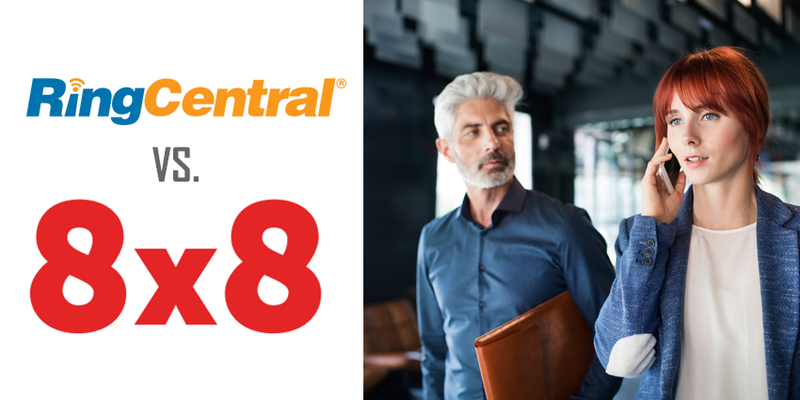 8×8: Revenue of $310.6 million per annum – read RingCentral vs. 8×8: Which Vendor is Right for You? Fuze: Revenue of $115 million per annum – read RingCentral vs. Fuze: Which Vendor is Right for You? Other competitors include Mitel, Avaya, and Verizon. What Does RingCentral Do Best? Because RingCentral’s portfolio is built on the cloud, it’s highly flexible and scalable. Customers don’t need to invest in an on-premise technology stack to get started with RingCentral products. Additionally, RingCentral’s platform integrates with a selection of leading applications and devices, so customising your workflow is easy. A wide range of phone services, calling options and phone numbers. Integrations with services like Box, Dropbox, Salesforce, Zendesk and many more. Outbound contact centre solutions like progressive dialling, predictive dialling and campaign management. Glip is RingCentral’s team collaboration application. Intended to help companies stay connected, despite dispersed teams and remote workers, Glip offers multiple modes of communication, including file sharing, task assignments, video conferencing and instant messaging. Like many of RingCentral’s products, Glip also integrates with leading cloud applications like DropBox, Github, Evernote, and Asana. RingCentral Professional is RingCentral’s virtual attendant and inbound call routing service. Designed for companies that need to maintain a professional image on the go, RingCentral professional offers easy mobility through instant and local toll-free numbers. By removing the reliance on the landline, RingCentral gives company executives the freedom to work anywhere, at any time, on the device they choose. Thanks to RingCentral, employees anywhere in the world can all enjoy the benefits of the same secure communications network. The Global Office system connects global workforces using a unique unified communication system that offers features like voice, instant messaging, and file sharing, no matter where your employees are.